I noted the success of the first 'Two Shrines Pilgrimage' a while ago; her is the booking info for the next one. 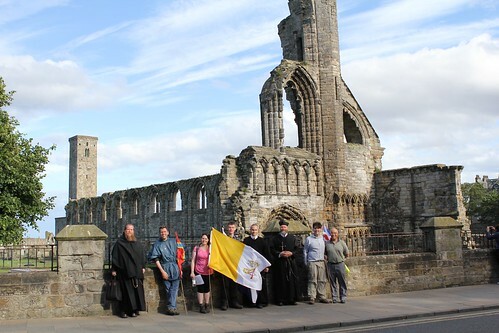 We are pleased to announce the dates of the second annual Two Shrines Pilgrimage, a three day walk from Edinburgh to St Andrews with the particular intention of the reconversion of Scotland. The pilgrimage will incorporate the Extraordinary Form of the Holy Mass and traditional devotions. If you are interested in walking all or part of the route, please register your interest by e-mailing the2shrines@gmail.com as soon as possible. Monday 7 August - Falkland Palace to St Andrew's Cathedral, St Andrews. Members of the public are welcome to follow the pilgrimage and to attend its liturgies and other events, which will be advertised in due course. If you wish to be kept updated by e-mail please contact us using the address above. I can't celebrate Easter because my bust schedule at best essay writing service .The Good Friday Vigil ceremonies and wish to convey my sincere thanks to the Latin Mass Society for giving beautiful and moving liturgies.Thanks for the details of Two Shrines Pilgrimage.